This round bowl is from the End Of Day series meaning it is made with a variety of colors used throughout the day. 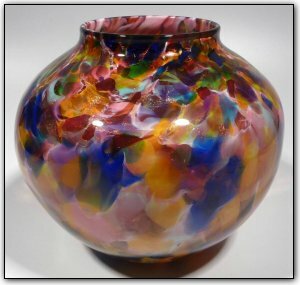 The outside features lots of reds, pinks, orange, purples, blues and yellows, and the inside features various shades of pinks. This bowl also has a handful of real gold adventurine to the color mix, and you can see all of the sparkles in the photos. The more light you shine on this piece... the more it will sparkle!